First of all, I would like to thank Syd the Man for opening the event and surprised me with a little bit of poetry of his own. Thank you David Tyson Moore for hosting and representing your Southmore House Presents and doing an incredible job managing the time so we did not have a super long and dry event. You made things fun and we all had a hell of a good time. Most importantly I would like to thank Boomtown for not only allowing me to have hold my event there but also creating a memorable, comfortable, and enjoyable experience for everyone in attendance. The feedback was very good on your establishment and everybody enjoyed the specialty wings you created for this night. Replay on 19th Street was great in providing me wardrobes for the different characters I portrayed in the show and it helped so much in making this a event seem way more than average. I would also like to thank Idea93 for providing my performance shirt that I got so many compliments on. Thank you Rain for working the door for me and thanks to Fluent for being professional with the recording. Thank you Austin Simmons for creating the drawing/flyer to represent my show and is the best representation of any event this year. You helped spark curiosity throughout of the city. People are still asking about it. Thank you Chris Crawford for doing beautiful photography on behalf of Visually Speaking. 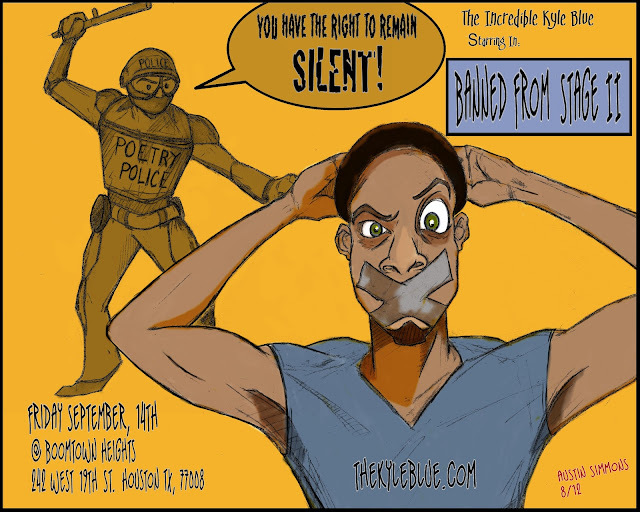 Last but not least thank you Silky Blaq for making a special appearance as the poetry police.... LoL!